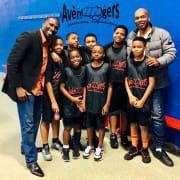 We are looking for professional coaches to coach our youth basketball team. We have to teams, 4th-6th-grade boys and 6th-8th-grade boys. Our practice schedule is Tue/Wed/Thurs for our 6th-8th-grade team and Mon/Wed/Fri for our 6th-8th-grade team. Our practice times are 7PM-9PM. We are practicing now to prepare for our upcoming league beginning the 3rd week of February. Background Clearance, professional image and attend a 60 min informational workshop.